Every day for the past six months or so, I’ve travelled across Canada — West to East usually — and it’s always been a memorable journey. Actually, the “Canada” I’m referring to is the Canada Hall at the Canadian Museum of History, and my task has been to oversee the removal of artifacts in advance of a redesign to be completed by July 2017. There were over 11,000 artifacts and other objects to be removed, and many of them were large and heavy. This was certainly not a one-person effort. As a Collections Coordinator at the Canadian Museum of History, I was part of a team that included Collections and Preparation staff, as well as outside contractors. If you ever visited the Canada Hall, you’ll remember a serpentine visitor route that wove back and forth through time and exhibit spaces. It was an excellent way to maximize use of the space. Unfortunately, that type of route is not so great when you need to remove artifacts . . . especially large ones. Specialists carry the seven metre canoe. Photo credit: Steven Darby. The larger artifacts were often a challenge, due to their size, weight and, in some cases, fragility. 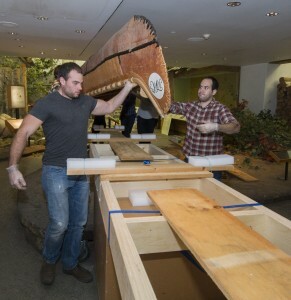 The large birchbark canoe in the Fur Trade exhibit was one such challenge. The canoe is 7 metres (almost 24 feet) long, which would make for a very tight diagonal fit in our freight elevator. On the positive side, the canoe is relatively light at just under 80 kilograms. To move the canoe, I decided to keep it mounted on the gunwales, as it had been displayed. We also fashioned a long pallet on a raised dolly, which would allow the canoe, once placed on the pallet, to be safely wheeled out of the exhibition space. 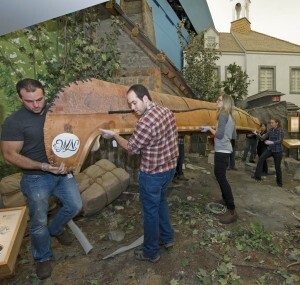 There were only two options available when it came to removing the canoe from the Canada Hall, which is located on one of the Museum’s upper levels. The first option would have involved having eight or nine people crammed into the freight elevator, holding up the canoe. Although we have sizeable freight elevators, the canoe would still have to be propped up diagonally from one corner to the other, and vertically from the upper right corner to the lower left. It would have fit, but just barely. The second option involved lowering the canoe through a light well to the first floor: a vertical drop of 15 metres. Specialists prepare the canoe for the 15 metre descent. Photo credit: Steven Darby. I decided on the second option, as I felt it posed less risk to the canoe, and required no more human labour than the first. We have all the necessary equipment onsite: a forklift, a boom and a heavy-duty come-a-long (winch). All I had to do was create a lifting frame to which I would attach the come-a-long cable. The lifting frame would then be positioned above the canoe and attached to the pallet at four points. A trial lift the day before ensured that everything was balanced and stable. When it came to the morning of the actual lift, it was a simple matter of raising the entire unit with the forklift boom, then manoeuvring it so that the assemblage was out over the rail. The unit was then lowered to a working height and, using the come-a-long, the entire canoe/pallet/lifting frame was slowly lowered to the floor below. It was successfully lowered onto the raised dolly and rolled to a collections space to await a conservation assessment. The entire lift took less than an hour and went very smoothly. Feel free also to comment or ask questions — I’m happy to provide whatever answers I can.